Harvard Provost Alan M. Garber (left, photo 1) and Michael R. Bloomberg, the principal speaker at Afternoon Exercises, prepare for the walk to Tercentenary Theatre to begin the morning portion of Commencement. President Drew Faust (photo 2) shares a moment with former President George H.W. Bush. Evelynn Hammonds (left, photo 3) escorts Aretha Franklin, one of the eight honorary degree recipients. Begone cold. Begone rain. 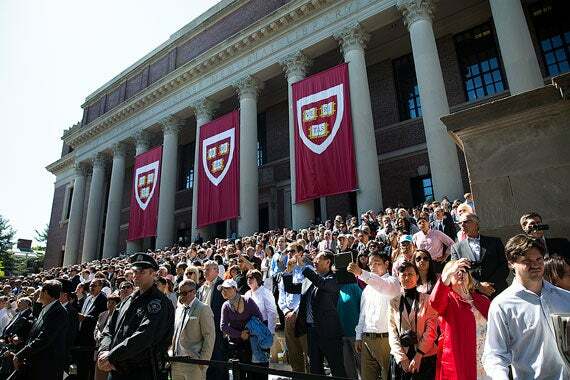 This was Harvard’s Commencement Day, where the annual outdoor ceremony depends on cooperation from the heavens to run pleasantly, smoothly, effortlessly. The 363rd Commencement Day got that assist, and then some. The unusually sunny and warm conditions were pitch perfect for the vast Harvard Yard celebration, with dapples of light piercing the verdant tree canopy of Tercentenary Theatre. Soon-to-be graduates beamed with bittersweet joy as they passed into the Yard, the joy that comes with reaching a goal hard-won, but also with knowing that the achievement means something deeply meaningful will be left behind. In the arriving throng, mothers, fathers, sisters, and brothers mastered the art of walking sideways, shouldering through the packed crowds, polite but determined to reach their seats because Commencement is a triumph for families too. 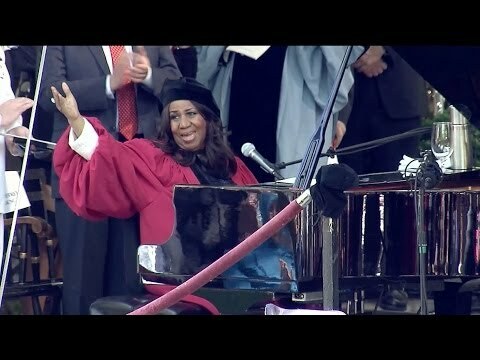 As the echoes faded from the high sheriff’s thrice-tapped staff and his loud, top-hatted declaration that the “meeting will be in ordeeeeer!” the crowd was asked to stand for the national anthem and first gasped, then cheered when the singer was announced: Aretha Franklin, the “queen of soul,” on hand to receive an honorary degree. The morning held Aretha and more: dignitaries in black robes and colorful hoods, replete with pomp and tradition as only a centuries-old institution can muster. There was held a former president and a former mayor, and the august treasure of some of society’s most accomplished individuals. But the morning was most pointed at the future, as a new generation of leaders, artists, teachers, scientists, designers, chaplains, doctors and many others received their degrees and prepared to make their marks in the wide world. 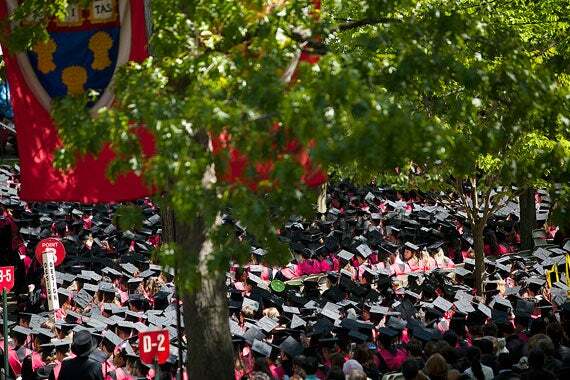 The story of Harvard’s Commencement Day is woven from the treads of hundreds of individual stories, a sampling of which follow. Sitting as far from the stage as you could get in the last row, tucked on a muddy patch of grass wedged between Widener Library and Boylston Hall, it was hard to see the massive video screens stationed around Tercentenary Theatre. But Debra Mendoza and her mom, Anita Hernandez, of East Chicago, Ind., didn’t mind. 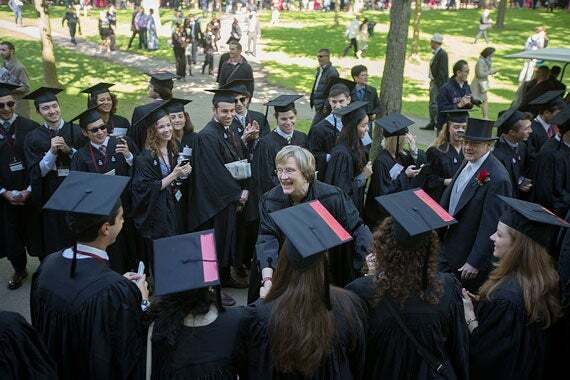 While they didn’t have an ideal vantage point to watch Mendoza’s son Manny graduate from Harvard College, they were grateful that the weather on this Commencement morning was sunny and warm, unlike the Class Day celebration. “It was cold, rainy. I’ll take this any day,” Mendoza said. The women were most eager to see Manny get his diploma later at Leverett House. Manny Mendoza, 22, won’t have much time to celebrate, however. Next week, he heads to Oklahoma as a chemistry instructor for two years as part of Teach for America. Smartphones were the item du jour during the first official ceremony on Commencement morning, a service at Memorial Church that included songs and a brief sermon. Seniors texted family and friends to see if they had secured seats in Tercentenary Theatre, and snapped photos of their classmates in their caps and gowns. And even with classes long over, one Kirkland House resident took notes. Walton used his own phone for perhaps the most important purpose of all: a selfie. “Let me begin by getting the most important thing taken care of: Everybody say cheese,” he said, proceeding to raise his arm for a shot of himself with the seniors jammed into the pews behind him. Soaking up the fun outside Memorial Church was Lowell House resident Christian Fohrby. A native of Denmark, he whistled the “Fair Harvard” hymn as he waited for his roommate, who had dashed back inside the church to grab the cap he had left behind. Several graduates who are part of the Dudley Co-Operative Society decorated their caps in grand style. Francisco Maldonado Andreu, a Romance languages and literatures concentrator, covered his hat with bits of memorabilia collected during his Harvard years. A little purple clown clinging to its edge was “a celebration for goofiness,” and reminded him of good times on campus. With all the visiting dignitaries and VIPs swirling around Harvard Yard, including former President George H.W. Bush, former New York City Mayor Michael Bloomberg, and singer Aretha Franklin, security, police, and the Secret Service had little to do, and calmly stood in the background. But shortly before Commencement began, one graduate’s father arrived at Morgan Gate with a grander flourish. A motorcade of state police motorcycles, black SUVs, vans, and a limousine pulled up, slipping into the Yard, and out came Turkish President Abdullah Gül, whose son Mehmet Emre Gül was graduating from the College. As students from Leverett House, the last College graduates to enter Tercentenary Theatre, made their way up the walkway, a well-meaning interloper threatened to derail their procession. A cute and spirited golden retriever puppy, sporting a jaunty scarf bearing the words “Future Leader Dog,” proved irresistible to a crush of students who hopped out of line to greet and pat the fuzzy yellow pooch, causing temporary disarray. It was late morning when George V. Kaplan ’40, M.B.A. ’47, sat down on a folding chair in front of Stoughton Hall. Across Harvard Yard and past University Hall, the crowds thickened toward the stage where Morning Exercises were underway. But a chair was free next to Kaplan, a trim man wearing a narrow-brimmed straw hat. “The Yard hasn’t changed,” he said, looking back on his own time there, starting 78 years ago. “That’s one of the few things.” When Kaplan graduated with a degree in political science in 1940, for one thing, there were no women in Harvard classrooms. (That would change in 1943.) “They didn’t think of it,” he said. By 1941, Kaplan had been drafted into the U.S. Army, where he spent the next 39 months as an enlisted man, much of it in combat in the Pacific theater. After the attack on Pearl Harbor, he was aboard a troopship heading through the Panama Canal. The first stop was Australia, where Kaplan said all the beer and Coca Cola was offloaded and replaced with ammunition. He and his ship continued on to Guadalcanal, where his unit went into the fighting in support of U.S. Marines. After the war, Kaplan enrolled at Harvard Business School. He graduated in 1947 and went into the insurance business. 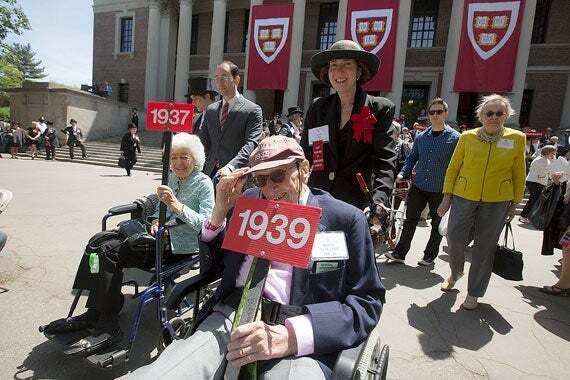 Representing the oldest College class was Robert Rothschild ’39. He studied physics as an undergraduate, and during World War II instructed radar officers and worked on some of the first early-warning systems. Returning after that to the family furniture business, he continued to cultivate his passions for mathematics, art, and saltwater sailing. Led by bagpiper Bob Cameron, the procession of 105 graduating seniors from Cabot House made the long but joyful walk across the grassy quadrangle this afternoon to collect their diplomas and bid farewell to a place they’ve called home for the last three years. The couple is wrapping up their fourth year as House Masters, a role they will continue to hold even after Khurana assumes his new post as dean of Harvard College July 1. Invoking Cabot’s rich history as part of Radcliffe College, where the women who lived there a century ago demanded suffrage and later full integration into the University, Khurana spoke of honoring the trust that society has placed in them as Harvard graduates and coming together during this period of great change on campus and in the world. The morning Commencement exercises in Tercentenary Theatre are partially a pageant, complete with top hats, tails, black robes, Latin speeches, famous honorands, and conferring of degrees. But the afternoon brings smaller ceremonies at the Houses, where the newly minted graduates receive their diplomas, and where tears and hugs flow freely among family and friends. Nearby, senior and Marine Corps 2nd Lt. Taylor Bruce Evans, his year-old son Connor in his arms, reflected on his time in Cambridge as a student and husband and father of two. “Everything becomes much more deliberate. You have to be very cognizant of how you spend your time, what your priorities are. You always have to-do lists,” said Evans, who heads to the Basic School in Quantico, Va., next month. 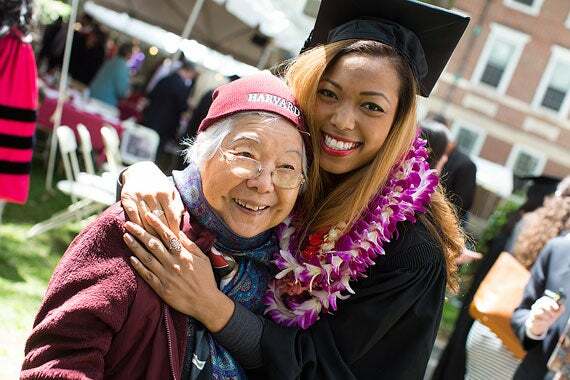 “Harvard has given me an opportunity to encounter people and learn perspectives that I never could have otherwise,” said Jasmine Park, a history and East Asian studies concentrator who posed for pictures with her proud mother and aunt. “I am super, super excited to see what my classmates are going to do and how they are going to change the world,” said Park, who hopes to work for a nonprofit in international development and then head to graduate school. What was likely the last official Commencement event in Harvard Yard late this afternoon had some swing to it, not like Aretha Franklin’s singing in the morning, but the kind of swing you might find, say, at Johnston Gate. Harvard’s main portal, on the west side of the Yard facing Massachusetts Avenue, will be 125 years old in December. Its filigreed wrought iron gates were built to accommodate the width of a carriage. A crowd of donors gathered at the gate to celebrate the spot’s recent facelift, including two new trees, soil, mulch, and groundcover (liriope) that will soon spread and bloom in season with violet flowers. Landscape architect Michael Van Valkenburgh provided the design pro bono. He is the Charles Eliot Professor in Practice of Landscape Architecture at Harvard’s Graduate School of Design. It was Samuel Johnston, Class of 1855, who bequeathed $10,000 to build Harvard’s first formal gate. His idea not only inspired 25 other gates, said Kamin, “but changed the course of Harvard architecture for the next century” by returning the aesthetically eclectic Yard to the classical Georgian style once established by Harvard and Massachusetts halls. 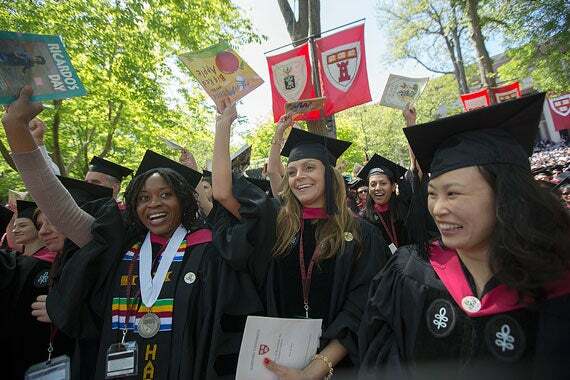 For a pdf version of the Harvard Gazette’s 363rd Commencement print issue, click here. Harvard Assistant Professor Luke Bornn teaches a statistics class on big data in Stone Hall in Quincy House, Harvard's first House renewal project.